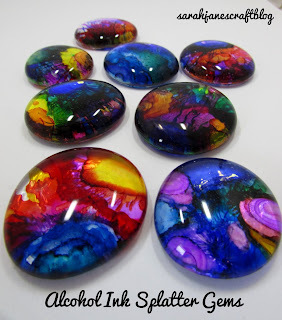 This blog's most popular post is from the first time I ever used alcohol ink on glass gems. Since then, I have tried out several strategies for inking gems. 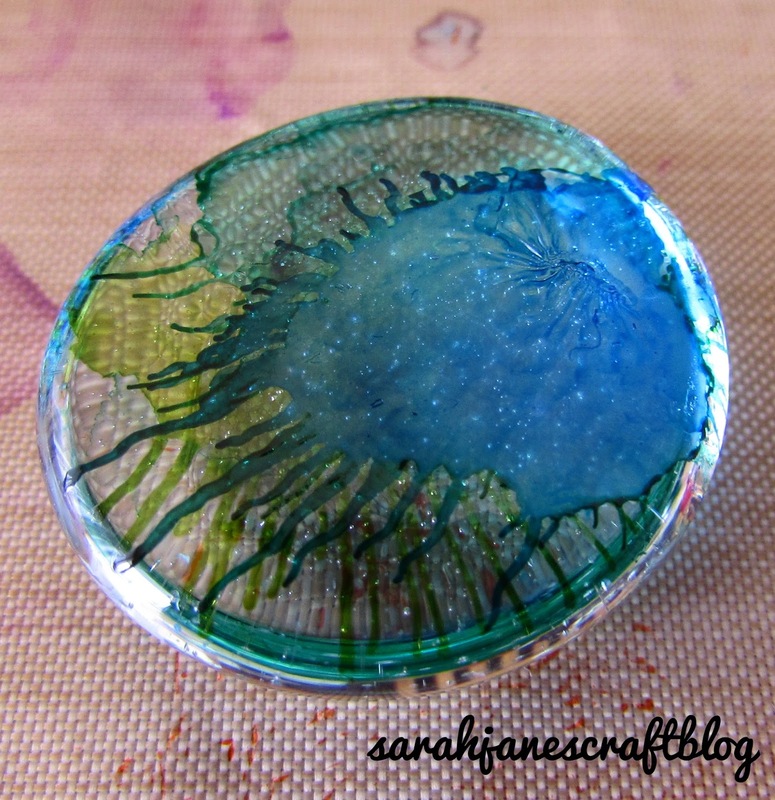 One that I could never get to work right was a simple drip and splatter technique. I had tried a few times to perfect the drip and splatter. I've been successful with tiles and vases and other larger surfaces, but never on the gems. So when I found some slightly larger (bigger than an inch) gems at Walmart, I knew I had to try it again. I rolled out my craft mats and brought out my alcohol inks. I also grabbed some rubbing alcohol, some paper towels, and some canned air. 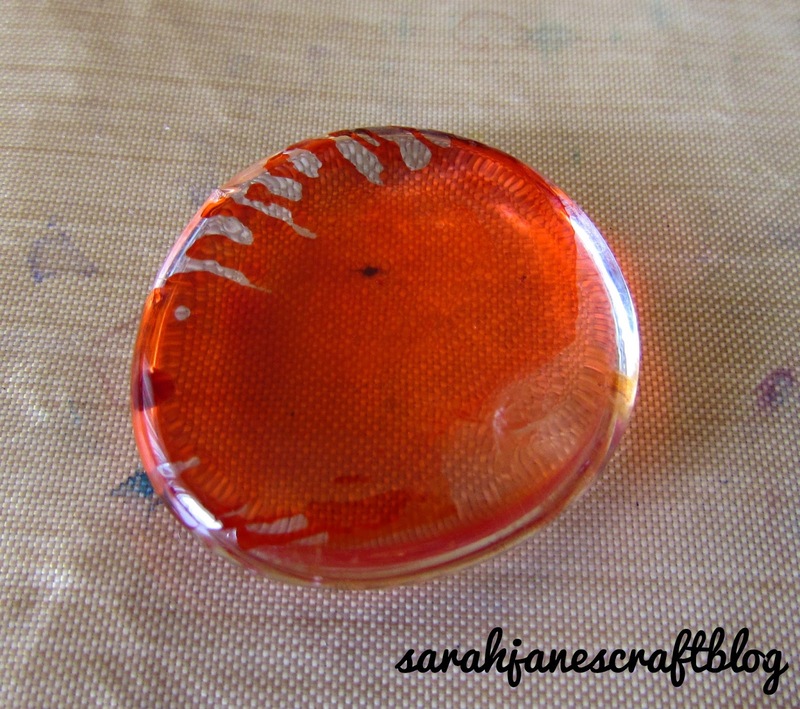 I started out by dripping a single drop of orange alcohol ink onto my gem. Then I used the canned air to spread it out. A single drop will cover nearly the whole surface. 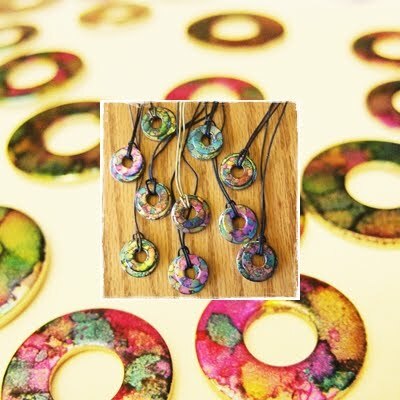 Which leads to one of the biggest problems with this method on such a small surface, when you add another color, it often overtakes the first one, making it very difficult to layer multiple colors. On the gem above, I have a red, orange and yellow drop of ink. This photo is before I used the air to blow the yellow ink. I think I decided not to so that it wouldn't clear out all the other colors. Another problem is that sometimes the ink will all blow off of the gem and pool underneath it. So it's a tricky process to get to work. After getting a little frustrated with dripping, I decided it might work better to brush the ink on with a paintbrush (the brush above is a water brush, but I didn't put any water or alcohol in the reservoir--I used several regular paintbrushes too for this process). I simply dripped a drop or two of alcohol ink onto a plastic palette (but a disposable plastic bowl or plate would work well too) and used the brush to apply it to the gem. I used the paint brush to smear on a blob of ink instead of dripping it. This allowed much more control for where the ink ended up at and how much area was covered. Not all colors of ink worked well for this process. The more saturated or bright colors worked the best. While the ink was still wet, I used the canned air to spread it out. 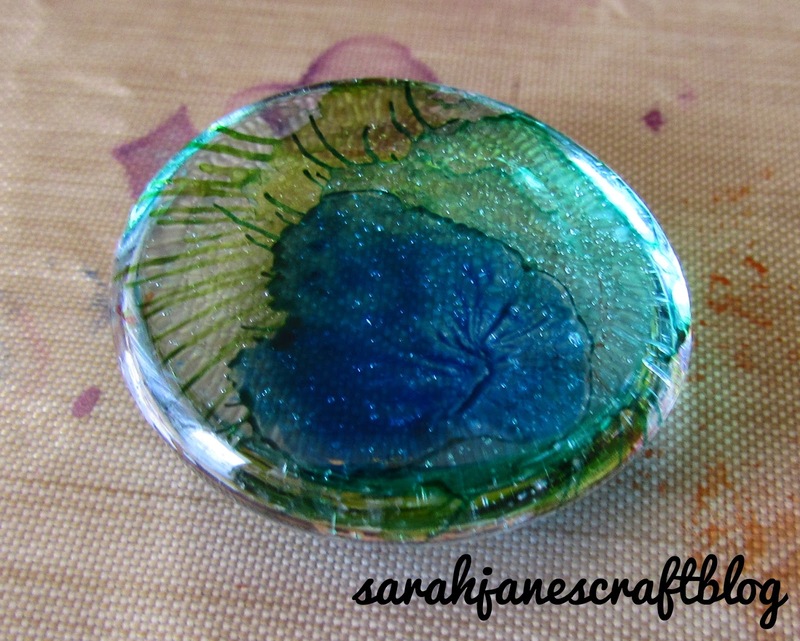 In the gem above, I had already layered a light green and an aqua before layering on a shade of blue. As I filled the gems in and added contrasting colors, I found that sometimes it worked to just dab the ink on with the paintbrush and not blow it around with air. 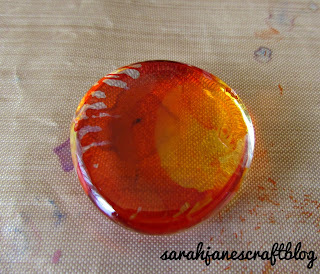 I could create little circles and dots and fill in areas easily this way. So I just kept at it--with a combination of dabbed, dripped, and dotted ink, I created some really pretty multi-color gems. I look forward to sealing these (probably with mod podge) and turning some of them into necklaces and some into magnets and possible backing some of them with foil tape. Some things I learned from this project: 1. Be gentle with the canned air. 2. If you have too much wet ink on your gem, let it dry first for a couple of seconds before using the canned air. 3. If a color seems to disappear after blowing the canned air on it, try a different shade of that color--some seem to work better than others. 4. Keep a cup of rubbing alcohol and some paper towels around to clean the brushes and the palette--the colors mix very easily and turn muddy brown very quickly if switching between colors. 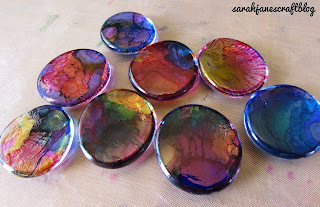 I have never tried this on gems, but I did cover some light switch covers and used a straw to blow the colors around. This worked well and you could control the air flow. 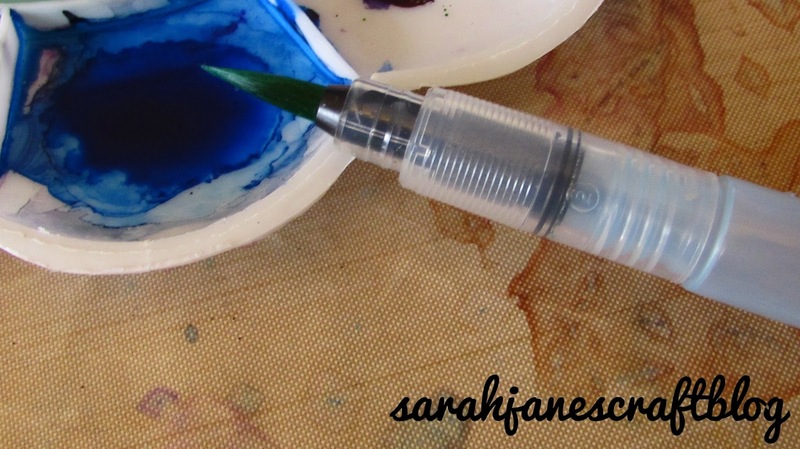 That might work with dripping the ink on since it needs to be pretty liquid for a straw to work. I'll add it to my to try list! Thanks for stopping by the blog! I love these. Can't wait to try my hand at making some. Thanks for sharing. Thanks! I hope yours turn out great! Thank you for sharing this method. I just got done making 13 of these and I wish I had read your method first. I think the ones I made are pretty but yours are prettier. 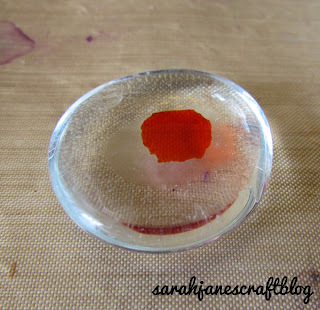 I think I will buy some more glass and try your method. I think I will just blow the ink with a straw. Although I do have canned air. Hope you next batch goes well! I love your gems, especially because the color is so Vibrant. When I make mine the color seems somewhat washed out. How do you get such great color on yours? Some colors of the alcohol ink just show up really light and others come out really bright. I like the Dockside Picnic and Summit View sets from Ranger and all of the Pinata colors are very bright/saturated. 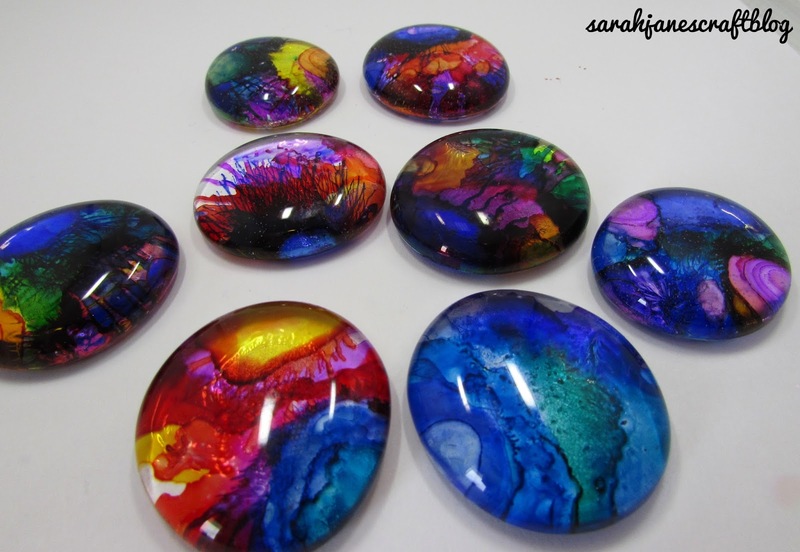 Though even if they are bright, they will still always be translucent unless the gems/marbles are backed with something. I'm a crafty geek who enjoys writing, board games, and bargain hunting. Sarah Jane's Craft Blog strives to post unique and interesting tutorials focusing on quick, easy, and inexpensive arts and crafts. New posts go up every Monday with occasional bonus posts on Thursdays. 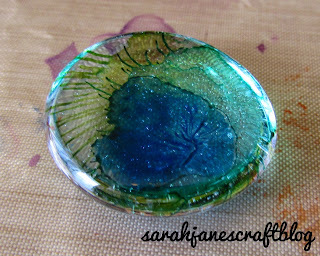 All photos and tutorials on Sarah Jane's Craft Blog belong to Sarah Jane and cannot be reposted without proper attribution (and preferably, permission). 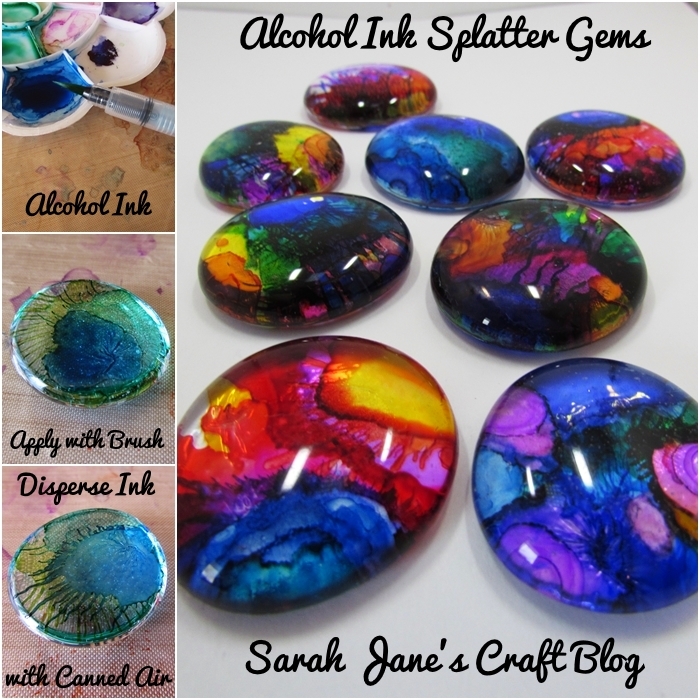 Sarah Jane's Craft Blog is not responsible for any accidents (injuries, property damage, etc...) that may occur while attempting these craft projects. Be safe and smart, readers! Comments that link to random websites or that are clearly advertising will be removed. Comments that include links to similar craft projects are welcome. Links to Amazon from this blog are affiliate links. Thank you for your support!